Product prices and availability are accurate as of 2019-04-23 23:04:26 UTC and are subject to change. Any price and availability information displayed on http://www.amazon.co.uk/ at the time of purchase will apply to the purchase of this product. 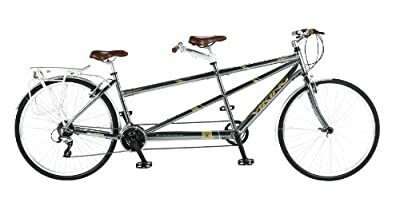 FRAME: 700c Design Lightweight Aluminium Tandem Frame, Gents Style Front, Ladies Style Rear, with Replaceable Rear Drop Out. FORK: Hi-Tensile 700c. GEARS: Shimano Acera 21 Speed with Shimano STI Control, EZ-Fire Plus Levers, Shimano Freewheel, Shimano Front Derailleur, and Shimano Acera Rear Derailleur CHAINSET: Triple Chainset with Alloy Cranks and Chainring Chainguard, 2 x Single Chainsets with Alloy Cranks and Chainring Chainguards. BOTTOM BRACKET: Eccentric Cartridge. WHEELS: 700c Alloy Silver/CNC 48 Hole Double Wall Rims with Alloy Hubs, Front Hub Quick Release TYRES: 700c x 38c Puncture Resistant All Black Tyres. BRAKES: Powerful Alloy 'V' Type Brakes with Shimano Alloy Levers. STEERING: Silver Riser Handlebars with an Alloy A-Head Stem and an Adjustable Reach Alloy Rear Stem SADDLE: Viking Comfort Padded Design Brown Saddles with Alloy Seat Posts. FEATURES: Brown Comfort Grips, Trekking Style Pedals, Full Chromoplastic Mudguards, Alloy Double Adjustable Rear Carrier with Bungee Straps. FRAME SIZES: 19"/16", 20"/18" COLOUR: Platinum Grey Frame and Fork. .